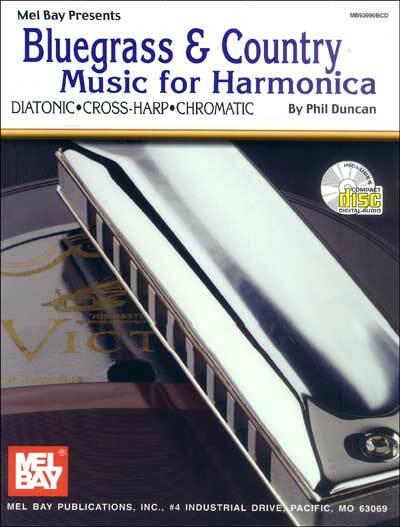 JAZZ STANDARDS HARMONICA PLAY-ALONG VOLUME 14 (CHROMATIC HARMONICA). Harmonica Play-Along. LIBRO E CD. LIBRO DI MUSICA JAZZ CON CD. CD DI BASI PER ARMONICA. The Harmonica Play-Along Series will help you play your favorite songs quickly and easily. Just follow the notation, listen to the CD to hear how the harmonica should sound, and then play along using the separate backing tracks. The melody and lyrics are also included in the book in case you want to sing, or to simply help you follow along. The audio CD is playable on any CD player, and also enhanced so PC and Mac users can adjust the recording to any tempo without changing pitch! Volume 10 features chromatic harmonica arrangements by Will Galison of: Autumn Leaves • Georgia on My Mind • Lullaby of Birdland • Meditation (Meditacao) • My Funny Valentine • Satin Doll • Some Day My Prince Will Come • What a Wonderful World. 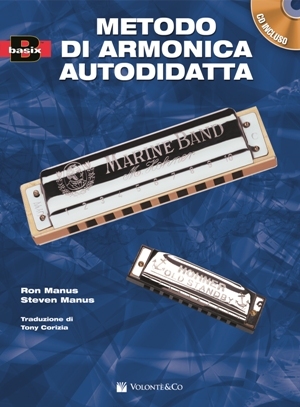 LIBRO METODO IN ITALIANO PER ARMONICA A BOCCA CON CD. ACCORDI, PENTAGRAMMA, TABLATURE PER ARMONICA. Traduzione italiana di un metodo per armonica diatonica e cromatica, che adotta uno speciale sistema di lettura delle note, che facilita l’apprendimento e assicura risultati pressoché immediati. Il libro contempla fraseggi Blues, Rock, Pop, Country e Folk, espressi nello stile dei più grandi artisti dello strumento (Billy Joel, Stevie Wonder, Bob Dylan, The Beatles, Bruce Springsteen, Huey Lewis). A completamento, un CD allegato che contiene gli accompagnamenti per tutte le canzoni e gli esercizi inclusi nel testo. Attention all harmonica enthusiast! Join in the fun of playing at a bluegrass festival with a bluegrass band. This book brings to you the often performed tunes by every bluegrass and country player of all instruments. Select a few of these tunes and play them on your harmonica and you will be an instant hit! The book contains diatonic, cross harp, and chromatic stylings on 48 country/ bluegrass favorites: Bile 'Dem Cabbage Down; Arkansas Traveler; Wildwood Flower; Old Joe Clark; Roll in My Sweet Baby's Arms; Crawdad Song; and many more. The stereo accompaniment CD has 18 of the songs recorded. All 18 songs are recorded on the beginning tracks with the harmonica, and again without the harmonica included. Shown in standard notation with lyrics, guitar chords & harmonica tab. below each musical line. 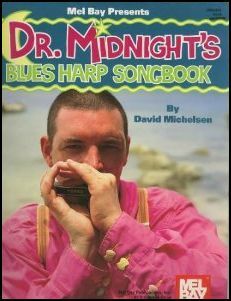 Normally you would use the C harmonica for this book. Tongue blocks 2 or 3 holes. The hole on the right (4) sounds. (3 or more tones together) will be produced. Mel Bay's DELUXE HARMONICA METHOD by Phil Duncan. The use of the slide button will give accurate half-step tones on the chromatic harmonica. in the key of G. (G is the draw tone in hole -2) F harp plays cross-harp in the key of C.
(C is a draw tone in hole 2 of the F harp) If the music is in the key of C use the F harmonica. To achieve the half steps or more, a blues technique called bending is used. BLUEGRASS HARMONICA, S. Mike. CD TAB. 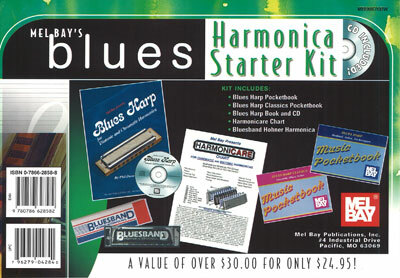 BLUES HARMONICA STARTER KIT. Metodo, CD, manuali, e un'armonica. TAB. per armonica. Includes Blues Harp Book/CD set, Harmonicare Chart, Blues Harp Pocketbook, Blues Harp Classics Pocketbook, and a Hohner Bluesband harmonica in the key of C. The book discusses the 12 Bar Blues, a touch of jazz, country fills (licks), and country tunes in blues style. The chart shows in considerable detail procedures for pinpointing and fixing common harmonica problems. All items are contained in a handy, white corrugated carrying case with a plastic handle. 152 PAGES. DYLAN BOB, THE HARP STYLE OF. Trascrizioni di 12 canzoni del più famoso menestrello della musica rock. Con discografia. Contiene: blowin' in the wind -don't think twice, it's all right -baby, I'm in the mood fot you -rainy day women #12 & 35 -just like a woman -I want you -I shall be released -I'll be your baby tonight -all along the watchtower -simple twist of fate -dark eyes -what was it you wanted. Tablature per armonica. By Bob Dylan. Harmonica/vocal songbook for voice, harmonica and guitar chords. 80 pages. With vocal melody, harmonica notation, lyrics, chord names, guitar chord diagrams, instructional text, performance notes and black & white photos. Folk Rock. 14 Scales and Modes in all 12 keys. The only harmonica method to present the chromatic harmonica in 14 scales and modes in all 12 keys! This book/CD pack will take beginners from the basics on through to the most advanced techniques available for the contemporary harmonica player. Each section contains appropriate songs and exercises (which are demonstrated on the CD) that enable the player to quickly learn the various concepts presented. Every aspect of this versatile musical instrument is explored and explained in easy-to-understand detail with illustrations. Covers: design and construction; correct breathing and hand positions; how to improvise; styles including traditional, blues, pop and rock; and more. 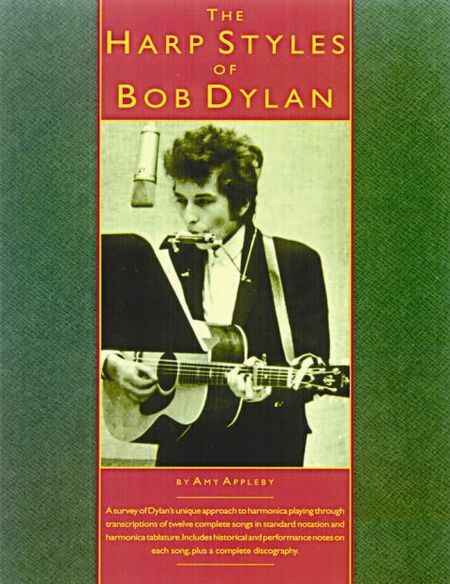 Includes 14 songs to illustrate each scale, and a reference chart for all chromatic harmonicas. 64 pages. Just for a moment, close your eyes and picture yourself listening to a sweet melodic sound. Listen as the sownd changes into a myriad of gutsy, soulful riffs, slowly easing out into a journey of new imaginative heights. You now have a clear impression of a seasoned, multi-talented musician. His name is Bobby Joe Holman. Those who are fortunate enough to hear him play his harmonica or who jam with him will say "... here is a regular kind of guy who makes you feel good inside and out, every time you see him perform." While in his early teens, Bobby Joe first heard Paul Butterfield play the blues on the harmonica, and from that moment on, he knew he was destined to play. He began with a $1.25 harmonica, trying to imitate everything that he heard. It took him a few years, but he finally got to the point where he began to play in clubs and at parties. He has built a career centered around the harmonica - his performances have spanned to albums, CDs, commercials, documentaries and movies. He has performed with various bands from Louisiana to California. He has endorsements with Fender, Hohner Harmonica and C.A.D. Technologies (an astatic harmonica microphone company). He has a publishing agreement with the worldwide sheet music giant, Hal Leonard Corporation. Bobby Joe has shared his love for the harmonica with countless students over the years, many of whom have gone on to perform. 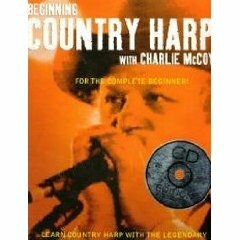 His instructional video Playing Nothin' but the Blues has just been released, and is the next step for the harmonica student who wants to learn how to play "The Blues on the Electric Harp." Bobby Joe brings fun into the classroom and truly believes anyone can learn to play the harmonica. Believe it or not it is very difficult to talk about myself, but I do want to give you an idea of my experience and background. My name is Bobby Joe Holman, and I am 61 years old. 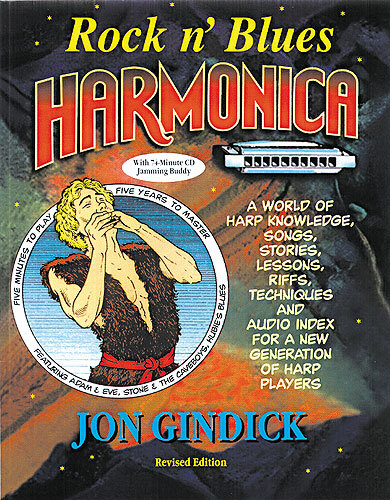 I have been Playing and teaching the "Art of Playing the Harmonica" for 38 years. I sing, play guitar and have been a Professional/Studio Musician for over 35 years. I have experience in Music Composition, Arrangement and Production as well as being an Internationally Published Music author. I enjoy performing but my Passion is Sharing my Love for Music with people while Unlocking their Creative Talent! Includes 74 minute CD jamming buddy!